My name is Regina Garcia and I am passionate about design and user experiences. I am currently working for Gensler, as part of their consulting team. One of the goals of my job as a design strategist is to help our clients a competitive advantage and creating experiences that go beyond a physical space by offering a variety of strategies that drive innovative, disruptive and sustainable initiatives. Born and raised in Mexico City I grew up inspired by its wide and rich culture. where eventually I had the opportunity to travel and study abroad in Italy, Canada and I have recently completed my MS on Strategic Design and Management in Parsons NY. I would say my multi-cultural background experience allow me to see a different perspective form a holistic point of view, I have a growing mindset that is flexible, has an ability to change, learn, and adapt. What project/job/event/research are you currently working on? I’m usually working on a few projects at once. Currently, I have a focus on developing workplace strategy for different global and local clients in Mexico City, to mention a few Roche, Daimler, JLL, Citi, Promotora Social Mexico, Creel. Together with change management programs for P&G, Prologis, etc. As a Designer, I am always excited to be involved in any learning and creative process, this became a continuous way of learning during my time in SDM program where I collaborated with deep analysis on human centered design processes and relevant problem solving challenges, that kept our curiosity and research skills developing. Design has a need for empathy, and this is about understanding humans experience, needs and desires. 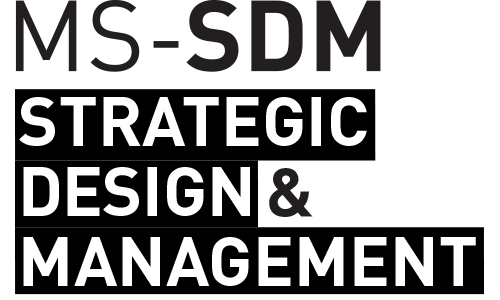 By uncovering these strategic thinking methodologies the SDM program provided me I can translate the clients’ needs and wants and aligning them with the company values and creative driven strategies to empower the possibilities of a solution. I currently use my skillset as an advantage to get closer to the end user. Every one of us is ambitious in our won different ways. We want to be our best selves. We want to be proud of what we’ve accomplished. We want to solve problems and help people. I believe that In this rapid evolving world, full of generation, technology and economy changes, the idea of innovation is to create an added value to the end user. We have an opportunity to be different, unique in a more profound way and co create business models, processes and results that will impact their daily lives. Innovation demands creative individuals who can dream new ideas and turn them into reality” …we can cultivate our own passion and perseverance. Be curious, explore, never say not interested or I don’t like to do that, you might ;nd that as many different things as you try, learn and practice it will help develop new skills and abilities. I currently have to divide my reading time in between studies and personal/ professional development. I am currently studying to become a certified LEED AP ID+C and “True Professionalism” by David H. Maister. On my personal development I’m actively reading The “Patanjali’s Yoga Sutras” as part of my teacher’s training to become a certified Ashtanga Teacher.